Hang on to your hats — the heat of the home garden season is on. As we continue to enjoy defrosted or canned pumpkin puree from last year's Great Pumpkin in muffins, curries and pies, we are thinking ahead by planning our harvest for the fall to come. Longer, warmer days offer plenty of inspiration to plant out summer bling over the last full moon (the Flower moon, FYI). What do I mean by summer bling? Those special plants that add splashes of color and flavor to meals all summer and beyond. Here are some of my favorites. We are lucky to live in berry country here on the North Coast. Of anything to plant in the home garden, berries are an excellent choice due to the ease of growing them versus the high price of buying them. Berries add nutrition and color to summertime breakfasts and smoothies, and may offer bumper crops for jams, jellies and pies. There's nothing more dazzling than picking fresh morning raspberries glowing like rubies thick with morning dew or enjoying the tart sweetness of a bowl of blueberries. The planting window for these is winter through early spring but there's no harm in planning for next year. If you've got them going already, here's how to get the most from them. Beautiful, tasty berries are easy to grow but do even better with a little help. Right now all the berries are setting fruit like crazy. To make them really pop, we are adding a few handfuls of spent coffee grounds and tea leaves to the soil under acid-loving blueberries, and composting and mulching around the raspberries and strawberries. All berries do best in full sunshine with room to expand. Strawberries require the regular maintenance of cutting back runners during berry season so that the plant puts it energy toward fruit rather than vegetative growth. To prevent pests such as snails, slugs and pill bugs from chewing moonscapes in our strawberries, we twist developing berries around each other to keep them off the ground. Birds love blueberries as much as we do so we cover them with a light plastic mesh or tie flashing silver paper to deter the birds from snatching. 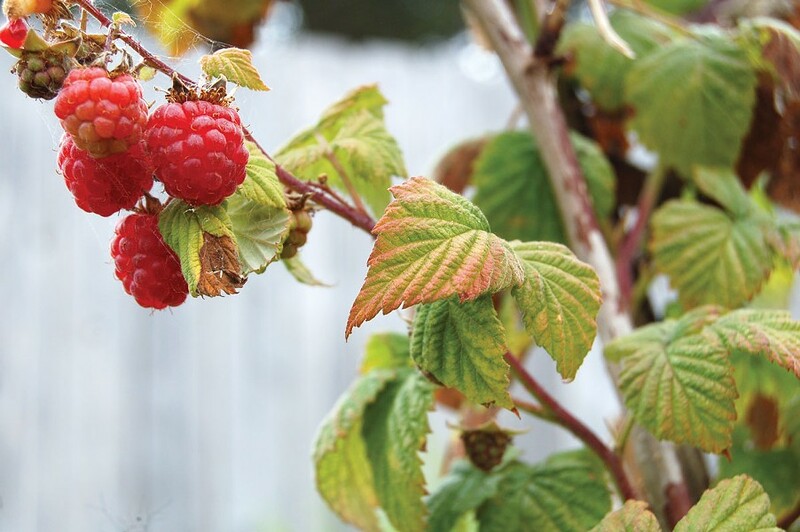 Raspberries like to roam, sending up canes outside of their designated raised bed. We cut them back to allow plants to concentrate on producing more berries. A few years ago, our generous neighbors cut down a spruce tree that shaded about a third of the farm. We, of course, wanted to thank them with home-grown garden bounty and they requested corn. We'd never had success with corn at the farm before but we set out the following year to try again. Nothing motivates better than returning a favor and we had success at last. Growing corn turned out to be pretty simple once we let it take over the backyard! Corn requires enough space in the garden to create a few rows. We don't mind, we love freshly picked corn so much that we decided to take out the back lawn and make a corn patch instead. The stalks transform the garden landscape with vertical texture and sound. Late last summer, just before corn harvest, there was a lightning storm. The wind whipped through the corn and lightning exploded white hot against a black sky. Who knows if that will be recreated this summer but we wouldn't want to miss the chance. Now's the time to get planting if you haven't already. We like to recreate the "three sisters" in our corn patch (winter squashes, corn and beans). Why not follow the expertise of Native Americans who've been planting these three together for more than 5,000 years? Corn provides a trellis for the beans, beans provide nitrogen for the corn and squash provides living-mulch weed control. We plant corn in hills made from freshly dug farm soil with coir-based planting medium (see the recipe "Victory Gardening," April 19). We feed fish emulsion (available at garden supply shops) into the soil and look forward to knee-high stalks by the Fourth of July. The first tassel offers the perfect summertime decoration. Fresh cobs arrive mid-to-late September and amaze us with their incredible sweetness. The price of commercial corn is expected to rise by 90 percent in the near future due to increasing distribution costs, so there's no time like the present to grow this amazing crop right at home. Pickling offers the home farmer an easy way to preserve garden bounty for later enjoyment. Homegrown pickles go beyond the quintessential deli dills. Abundant harvest of green beans, carrots, corn, cucumbers and zucchini all make delicious pickles. We're not afraid to pickle exotic combinations of vegetables and spices, either, but cucumbers are a fine place to start and you're just in time to plant if you hurry. Last year we experimented with companion planting and discovered the amazing cucumber-sunflower garden. Sunflower stalks provide trellis structure for cucumber vines, as well as dappled shade cucumbers prefer and something beautiful to look at. Allow your imagination to wander through all of the tasty and pretty possibilities.